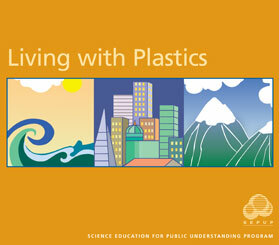 Living with Plastics is a SEPUP module designed for use in grades 7–12. The module contains a series of 8 activities that provide approximately 3 weeks of instruction. Today, many different materials are used to produce the same product. What is the best material to use? What are the trade-offs in selecting one material over another? Students address these questions by focusing on the development and use of plastic. Students investigate the properties of different plastics and read about the history of plastics development. They are introduced to the basics of polymer chemistry and model the effect of cross-linking on polymer properties. Students also explore the properties of natural polymers and relate these properties to their everyday uses. Students then apply their knowledge of plastics to evaluating competing claims about the usefulness of plastics. Students are assessed on their ability to use evidence and identify trade-offs when making a decision.